You've seen the picture on social media, walked for miles, hiked up a mountain and you finally arrive at that perfect isolated spot - only to find a queue of people waiting to take the very same photo. An image of people queuing to take photos at the summit of Roy's Peak, in Wanaka, New Zealand, is proving very popular on Reddit, where it received more than 75,000 upvotes in 24 hours. 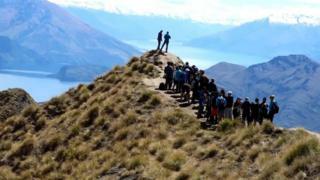 A spokesperson for New Zealand's Department of Conservation said visitor numbers to the Peak had increased by 12% to 73,000 between 2016 and 2018, because the spot had become a "quintessential icon for the Wanaka region through social media". However, she added that queuing on the top to get the perfect photo is not obligatory: "It's just the way some people on any given day will sort themselves." One Trip Advisor website user said: "Roy's Peak is one of the most instagrammed spots in NZ. So there were a lot of people at the viewpoint to get that desired photo. It was hard to get a photo without several strangers in it, and a tad awkward posing for a picture with such a large audience." Another questioned the impact of so many visitors at the site, writing: "The track is also changing as more people walk on it in such large volume. I wonder what damage it does to the land!" The Department of Conservation has issued some advice for visitors, asking them to give due consideration to the wildlife in the area, to be properly prepared for the hike to the summit and to be willing to turn back if weather conditions change. The Roy's Peak track crosses private land at lake level, before going through farmland and then up to the 1578m (5,177ft) summit. Chicko Handoyo visited Roy's Peak and tweeted: "When I was there, the queue was only about 10 metres from the edge." Many people have criticised the photos, saying it's a "sad" world where taking a photo is seen as more important than just enjoying a beautiful view. "Sheep, lemmings and zombies; an entire society slipping away into a self-absorbed web of narcissistic thread," commented Bobby on Twitter. Pauline tweeted: "This really upsets me. What is wrong with these people? If I hiked all the way up and finally got to this view, I would just stare and cry and be thankful I got to see it." And it's not only backpackers who have been flocking to take in the stunning view. One US couple eloped, flying to the peak via helicopter to get married on the very same spot. Others have commented on how they have encountered similar queues at other beauty spots around the world, including MrCoffee999 on Reddit who wrote: "Had this experience when we went to the Fushimi Inari Gates in Kyoto, Japan. "Everyone posing on the way up the mountain made it not enjoyable for us having to stop every 10 seconds to wait for people to pose and snap photos."